London in its Original Splendour, 2018. 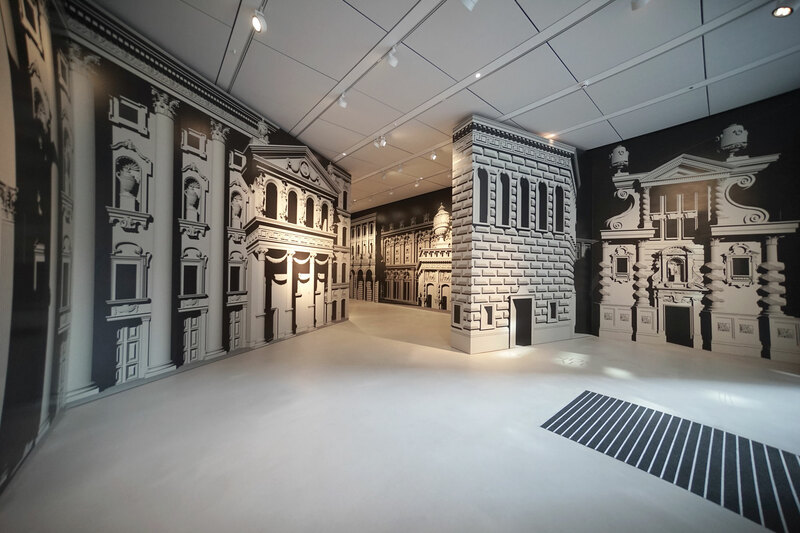 Celebrated artist Pablo Bronstein enveloped the gallery in a 3D-rendered wallpaper, inspired by historic design and architecture. The striking transformation featured Bronstein’s most complex wallpaper design to date, rich in decorative and architectural motifs. Whole buildings, including exterior and interior areas, were rendered in great detail. In the ‘distance’, expansive vistas appeared to open up between structures, revealing wider views of the fictionalised cityscape. Bronstein drew on a wide field of reference, from the elaborate visual effects devised by Renaissance and Baroque masters, to the design legacy of the site’s nearby buildings of Christopher Wren, John Soane, Edwin Lutyens and James Stirling. In doing so, Bronstein characteristically stirred the pot of architectural history and styles – inviting you to join him in the uniquely immersive installation.